The much-anticipated (and deserved) warm weather months are finally upon us! We've hit the ground running this Spring/Summer with a slew of community programs, activities and annual fundraising events. On Thursday, May 1, 2015, St. Francis Food Pantries and Shelters held its Sixteenth Annual Theatre Event featuring the new musical "Something Rotten" at the St. James Theatre. Event Honorees Edward Piccinich (EVP, SL Green Realty Corp.) and John M. Vazquez (SVP, Global Real Estate, Verizon) both received the St. Francis Award onstage, presented by cast members John Cariani and Tony nominee Brian D'arcy James. The performance was preceded by a cocktail party at the famed New York Marriott Marquis where over 1,300 guests mingled in anticipation of the evening. Our ever-popular "Peanut Butter and Jelly Sandwich Making Day" Program has continued to be a great way for companies to engage employees on a mission to give back to others. Volunteers from Bloomingdales and Maxons Restorations recently made hundreds of PB&Js that were distributed to various food pantry locations we support. 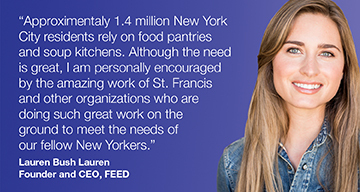 Lauren Bush Lauren and FEED volunteers joined us on a March afternoon to help us serve meals for lunch. Employees from Colgate "cared, volunteered and smiled" while packing thousands of hygiene kits for the less fortunate. Mother's Day 2015 has come and gone and volunteers from Interpublic's legal department helped to ensure that we celebrated a special group of mothers in a meaningful way. 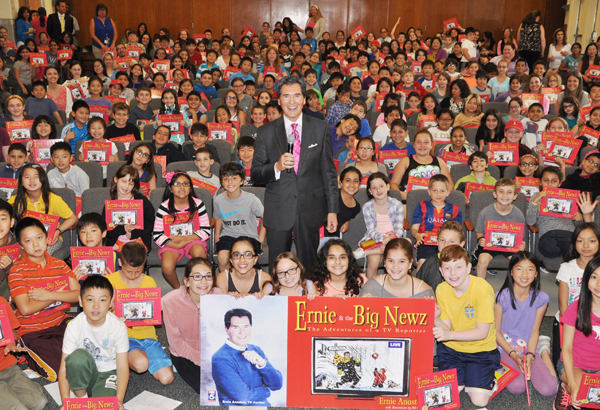 Celebrated news journalist Ernie Anastos recently spent the morning with us for a very fun and important literacy project. Be sure to connect with us on social media: Facebook, Twitter, Instagram for all things #StFFP, #DoodleForHunger, #SpinForHunger and more!